Needle free injection is extensively being used for mass immunization programs aiding with reduction of costs by eliminating the need of needle replacement after every use. On account of high prevalence of pediatric population around the globe, the needle free injection market is attributed to grow owing to ease of drug or vaccine administration. Additionally, increasing demand for non-invasive medical procedures and therapies are estimated to boost the market growth. Moreover, growing diabetic population in all age groups and properties of needle free injections such as improved dosing accuracy and rapid administration among other are panned to contribute substantially towards the growth of the needle free injection market. The needle free injection market is anticipated to record a significant CAGR of 12.4% over the forecast period i.e. 2018-2027. Many multi-national companies are concentrating towards new product advancements in needle free injections to offer many more advantageous properties of these injections. 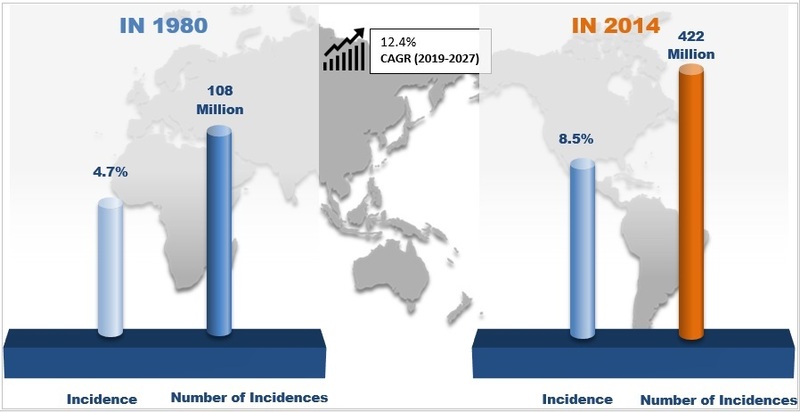 Advancements in healthcare industry in the past few years and growing worldwide healthcare organizational initiatives in order to eliminate needle transmitted diseases is projected to drive the market’s growth rapidly. Besides, there is a wide range of functions of these injections in an immense range of applications such as vaccine delivery, insulin delivery, pain management and others that are estimated to boost the market robustly during the forecast period.On the basis of regional platform, the global needle free injection market is segmented into five major regions including North America, Europe, Asia Pacific, Latin America and Middle East & Africa region. 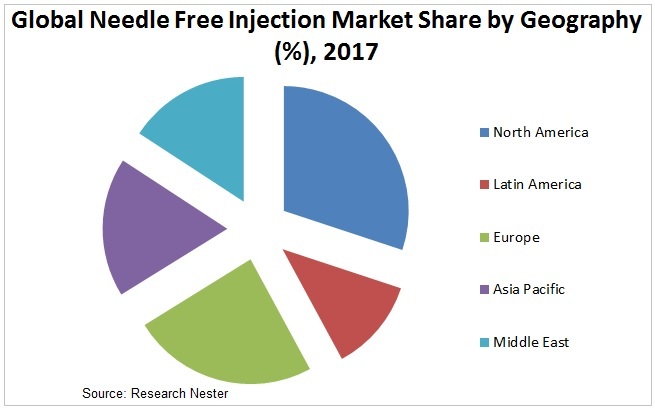 On the back of its innate nature to adopt various technologies at their nascent stage of innovation, North America market for needle free injections is anticipated to showcase a flourishing growth over the forecast period. Europe is panned to follow in the footsteps of North America on account of growing geriatric population with decreasing healthcare costs owing to increasing governmental initiatives across the region. The number of chronic diseases has been observed to increase in the past decade on the back of increasing incidences of needle borne injuries and disease transmission. These diseases include hepatitis B, hepatitis C and HIV/AIDS among others for which various government organizations are taking favorable initiatives in order to eliminate them. Some of these organizations are World Health Organization, Center for Disease Control, Gates Foundation etc. The WHO stated that approximately 325 million people were living with HCV or HBV in 2017 across the globe while 940 000 people died from HIV-related causes globally. An estimated 36.9 million people were living with HIV at the end of 2017 which triggered serious concerns around the globe regarding usage of needles. Such factors are expected to augment the market over the forecast period. The WHO reported that in the year 2016, diabetes was the seventh leading cause of death across the globe. As per its reports, the incidence rate of diabetes has been rapidly increasing with the numbers ranging from 108 million cases during 1980s to 422 million by the year 2014 with an increased percentage in prevalence from 4.7% to 8.5% among population over 18 years of age. As per International Diabetes Federation, approximately 425 million adults around the globe in the year 2017 lived with diabetes which is further anticipated to increase to 629 million by the year 2045. Moreover, the rising cases of children suffering from type I diabetes (as reported by International Diabetes Federation) was more than 1,106,500 children in the year 2017 which is further estimated to increase as well. Collectively, these numbers are estimated to serve as the leading factors behind the growth of needle free injection market for insulin delivery in upcoming years. Additionally, rising demand for self-injectable devices along with decreasing healthcare costs are estimated to aid the market growth during the forecast period. However, limited usage of needle-free injections for intravenous administration along with priming of the systems before each use is expected to serve as a key restraining factor impacting the worldwide growth of the needle free injection market over the forecast period.